Named EPIC 204278916, the star is estimated to be about the size of our Sun in diameter, but has only half its mass. 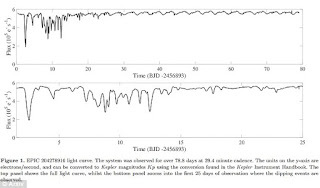 It was discovered by NASA's Kepler spacecraft in 2014, and ever since, a team of astronomers led by Simone Scaringi from the Max Planck Institute for Extraterrestrial Physics in Germany have been keeping tabs on its dips in light, or 'light curves'. 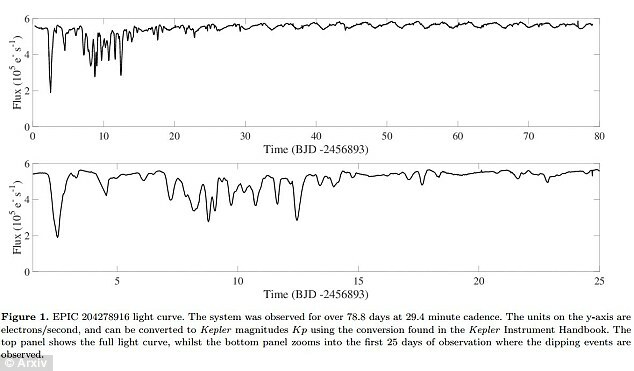 Back when researchers were trying to explain the irregular and large dips in brightness of KIC 8462852 - also known as Tabby’s star - they came up with two plausible explanations and one... not-so-plausible explanation. The first plausible explanation was that the large and irregular light curves were being caused by a massive swarm of comets orbiting the star. 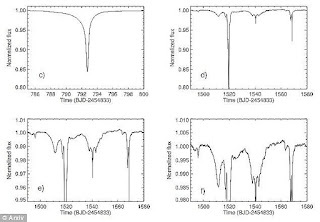 The second suggests that KIC 8462852 is a 'distorted star' that spins so fast, it becomes 'oblate', meaning it has a larger radius at the equator than it does at the poles. As Paul Gilster from Centauri Dreams explained, "This produces higher temperatures and 'brightening' at the poles, while the equator is consequently darkened." The not-so-plausible explanation is that the dimming is being caused by a kind of Dyson Sphere - a gigantic sphere made of solar panels that completely encircles a star, featured in several science fiction stories. "Aliens should always be the very last hypothesis you consider, but this looked like something you would expect an alien civilisation to build," Jason Wright, an astronomer from Penn State University, told The Atlantic at the time of the discovery. Since then, neither plausible explanation has turned out to be all that convincing. Researchers have pretty much rejected the 'distorted star' hypothesis, and a study back in January asserted that for a star to dim by about 20 percent over the course of an entire century, it would require some 648,000 comets - each about 200 kilometres wide - to have transited it, which isn’t exactly plausible. The German team behind the new EPIC 204278916 observations suggests that its massive dips in the light curve could be caused by the existence of a protoplanetary disk that’s oriented 'edge-on' in relation to Earth. That orientation could mean it's not only blocking the light from the star at certain times, we're also at the wrong angle to be viewing its own infrared radiation. A protoplanetary disk is a rotating disk of dense gas and dust that tends to surround a newly formed star, which is plausible in this case, seeing as EPIC 204278916 appears to be relatively young - no older than 11 million years. To put that in perspective, our Sun is estimated to be around 4.5 billion years old. "Many disks are very thin, and we’re used to seeing them at an angle. However, every once in a while, we’re bound to be aligned with a star that has its disk oriented edge-on to us, which means that any infrared radiation would be invisible, Young Stellar Objects (YSOs) are known to have the large flux dips that this weird star has, and they’ve recently been shown to come in a variety of inclination angles." Ethan Siegel explains over at It Starts With a Bang. The best part is the hypothesis could be applied to KIC 8462852 too, says Siegel. 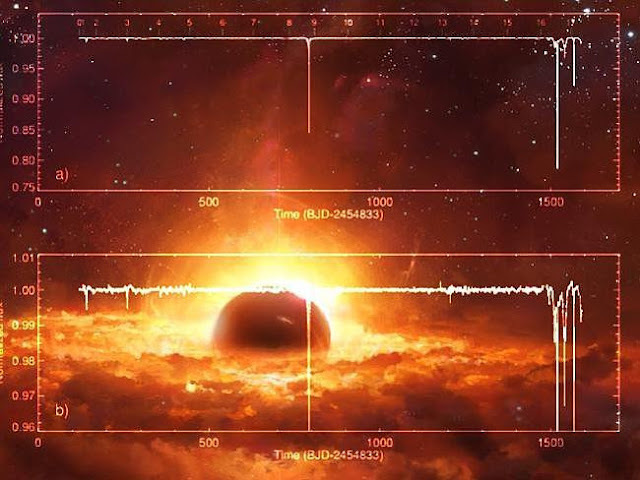 While KIC 8462852's age was initially estimated to be hundreds of millions of years old, a number of astronomers have argued that it could be much younger - just like EPIC 204278916. And even if it's not, mature stars have been known to host rings of 'cometary-like debris', or dust, called circumstellar disks, which always include a vast outer disk, but often an inner one as well. One of these circumstellar disks could be surrounding KIC 8462852 in an eccentric orbit that's messing with our observations in a similar way to an edge-on protoplanetary disk. "If this star turns out to be younger than is generally accepted (which many professional observers think it is), if it has a disk that happens to be edge-on (so we don’t see the infrared flux), and if there’s either a warped inner disk or cometary-like debris, then what we’ve discovered is a new stage in the early evolution of a class of stars!" Siegel explains. The German team's observations have yet to go through the formal peer-review process, so they're very much up for debate at this stage. They've just gone up on pre-print site arXiv.org, so other researchers now have the opportunity to try and poke holes in their hypothesis. 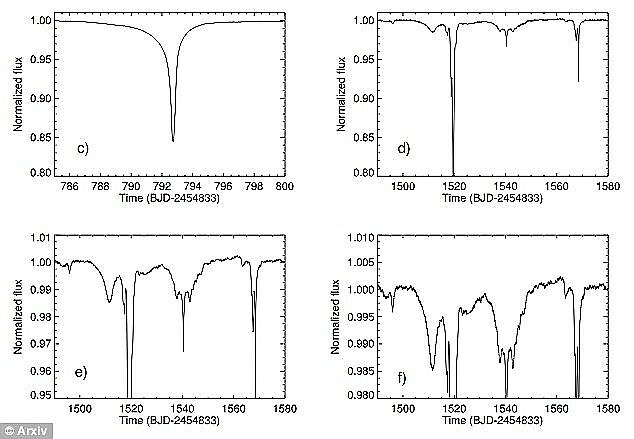 It's going to take a whole lot more research to figure out if this hypothesis can explain the weirdness of KIC 8462852.